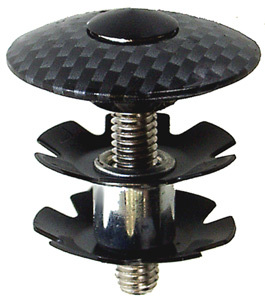 This type of adjuster is safe to use with carbon steerers. 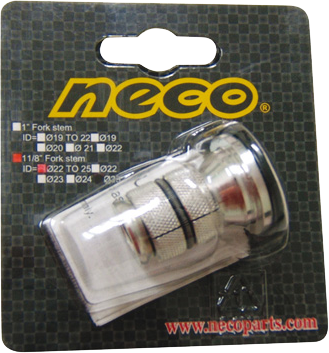 Knurled expander part clamps to the inside of the steerer, black aluminium top-cap is used for adjusting the play prior to tightening the stem bolts. Reusable design, from inner diameter 22 mm to 24 mm. 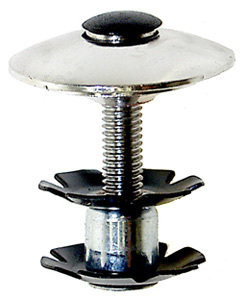 Mighty Ahead adjuster 1 1/8"
Conventional adjuster for 1 1/8" metal steerers. Hammer in for secure and accurate adjustment of threadless headsets. We recommend you use an appropriate tool to fit this item. Conventional adjuster for 1" metal steerers.